Are we on the cusp of global collapse? The standard run assumes business as usual, using parameters found from the 1900-1970 data. The comprehensive technology scenario models the attempt to reach sustainability through the application of a broad range of the usual (green dream) technological solutions. The stabilised world scenario uses both technology and social policies to achieve equilibrium in key factors like population, food and consumption. Our previous comparison of global data with the LtG modelled scenarios has been updated here to cover the 40-year period 1970 to 2010, i.e., from when the scenario simulations begin. The data has been compared with the outputs of theWorld3 model for three key LtG scenarios: standard run, comprehensive technology, and stabilized world. The data review continues to confirm that the standard run scenario represents real-world outcomes considerably well. This scenario results in collapse of the global economy and population in the near future. It begins in about 2015 with industrial output per capita falling precipitously, followed by food and services. Consequently, death rates increase from about 2020 and population falls from about 2030 – as death rates overtake birth rates. The collapse in the standard run is primarily caused by resource depletion and the model response of diverting capital away from other sectors in order to secure less accessible resources. Evidence for this mechanism operating in the real world is provided by comparison with data on the energy required to secure oil. Indeed, the EROI has decreased substantially in recent decades, and is quantitatively consistent with the relevant parameter in the World3 model. The confirmation of the key model mechanism underlying the dynamics of the standard run strengthens the veracity of the standard run scenario. 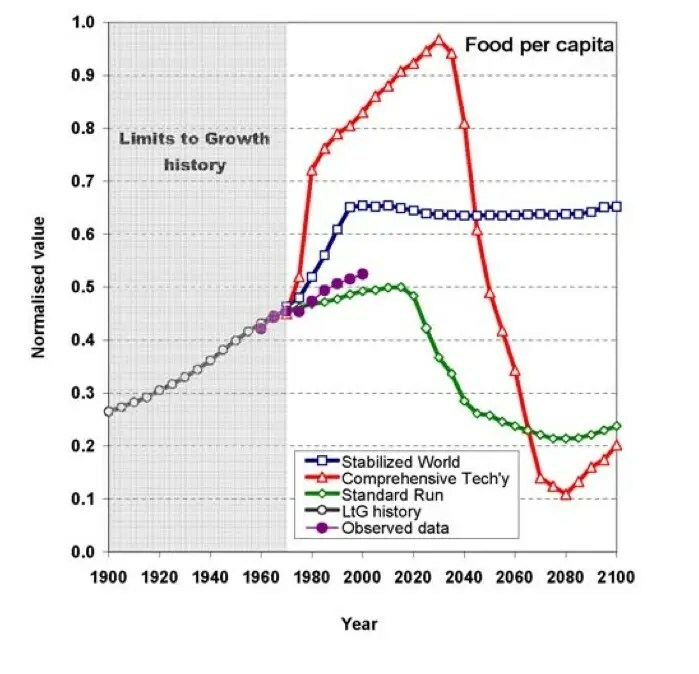 The issue of peak oil has also affected food supply and evidently played a role in the current global financial crisis. While the GFC (global financial collapse) does not directly reflect collapse in the LtG standard run, it may well be indirectly related. The corroboration here of the LtG standard run implies that the scientific and public attention given to climate change, whilst important, is out of proportion with, and even deleteriously distracting from the issue of resource constraints, particularly oil. Indeed, if global collapse occurs as in this LtG scenario then pollution impacts will naturally be resolved, though not in any ideal sense. Another implication is the imminence of possible collapse. This contrasts with the general commentary on the LtG that describes collapse occurring sometime mid-century; and the LtG authors stressed not interpreting the time scale too precisely. However, the alignment of data trends with the model’s dynamics indicates that the early stages of collapse could occur within a decade, or might even be underway. This suggests, from a rational risk-based perspective, that planning for a collapsing global system could be even more important than trying to avoid collapse. Climate Change is accelerating so fast at the moment that it may well have more of a role in the coming collapse than Dr. Turner concedes, but in the end that’s just quibbling in the face of momentous changes that both the model and the data suggest are coming. 2015 just doesn’t seem that far away any more……. I’m interested in whether the LTG3 model analysed the benefits of sustainable, clean, green GenIV nukes that could run the world for 500 years on the nuclear waste we have stored in cooling ponds today? Let alone the ‘renewable’ supply of uranium we get if we extract uranium from seawater, which is constantly topped up by continental drift and erosion carrying fresh uranium particles down into the ocean. Once you have abundant, cheap enough, clean energy that is sustainable for hundreds of millions of years: many many other limits fall into place around a world wide demographic transition. Safely shuttering a nuclear power plant requires a decade or two of careful planning. Far sooner, we’ll complete the ongoing collapse of the industrial economy. This is a source of my nuclear nightmares. When the world’s 443 nuclear power plants melt down catastrophically, we’ve entered an extinction event. Think clusterfukushima, times 400 or so. Ionizing radiation could, and probably will, destroy every terrestrial organism and, therefore, every marine and freshwater organism. That, by the way, includes the most unique, special, intelligent animal on Earth. Electricity is only one form of energy that we use and is not a very mobile form. Oil is the energy that drives our civilization and while we use a lot of coal we use oil to mine and ship the coal. The oil will run out and that time not far away even though the oil companies trumpet the shale oil “bonanza”. However to concentrate on electrical energy alone is to look at one small part of civilizations problems. They are many but here is one, for instance. How can an exponentially expanding population be fed with a rapidly diminishing supply of accessible phosphorous. The limits to growth looked at the whole picture, not just one aspect, something that many of us, you included (eclipse now) seem to find difficult. It maybe that we will solve the problem of electricity storage, (batteries) at some time in the future. But, to depend on technology solving all the problems is akin to jumping off a cliff confident that one can come up with the ability to fly before the ground meets you. It may be exhilarating for a while but in the end it’s fatal. While we have been talking about resources we have been using up time; it is now running out. In retrospect we may come to realise that ‘peak-time’ may have been away back in the 70’s when Limits was first published. I attended the Limits to Growth – Beyond the Point of Inflexion symposium at the UNSW last Wed 11/12/13, and it was very illuminating. 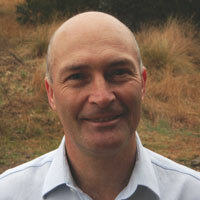 Jorgen Randers, one of the original LtG authors presented, but I met Dr Graham Turner there as well. 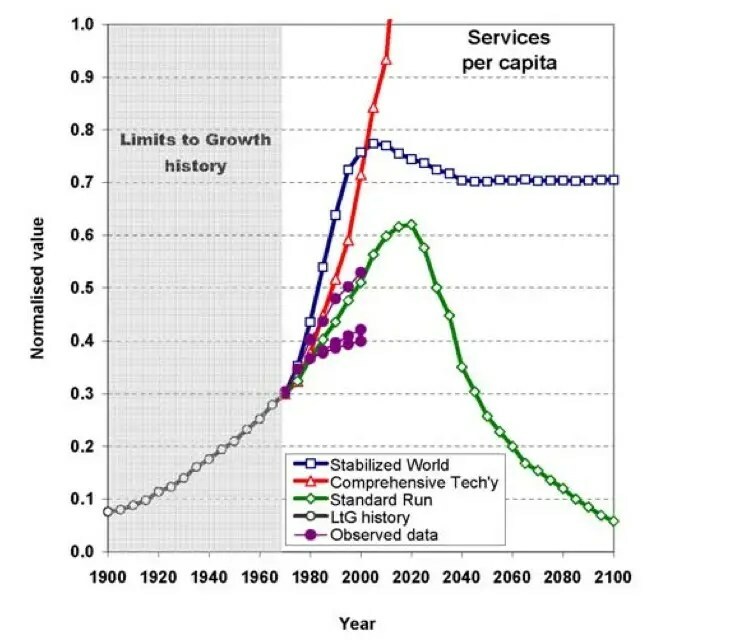 Graham put me on to his 40 year update, as I had read his 30 year one, and he mentioned that the current status had a levelling out of services and that it seemed to be due to Peak Oil. I will need to read his full report to check out exactly what he meant. Ross Gittins stole the show with his cap and trade idea for scarce resources, which would price in the externality costs such as environmental degradation etc. This would need limits (global and local) to be determined for top scarce resources (cropland, soil, freshwater, ti, antimony, lead, silver, gold, copper…), which Ross admitted would be complex to setup. He also mentioned that trade-exposed businesses could be protected by using a GST-like system of credits on scarce inputs that would be needed for exported goods until I imagine that he assumed a global system would be in place. The charts are illegible. Can that be remedied? Sorry, I haven’t found better resolution ones yet….. when I do I will replace them. good, when enlarged the lettering lost all coherence. Actually, you’ve prompted me to look again, and I have now fixed the problem…… thanks for making me make the effort! It’s scary how well the standard graph is matched by the 40 year results. One other thing. The debt bubble is not included in the original report. It’s now so huge that it alone could make the necessary trigger for collapse. When you read Graham Turner’s Cusp report carefully, he shows that we are on track for the early collapse scenario, but predicts collapse around now not in 2050. This in effect predicted the GFC. I read your paper and saw the Ted talk of Harald Sverdrup. We are right on the track. How come that gold and oil prices are weakening? I believe it’s due to the US Dollar manipulation… it’s going up, so everything else goes down in relation to it. and how bad things are, and going to get worse. As I watch the euro losing another 1.3% against the dollar today, it’s now at $1.25, and down from close to $1.40 recently, it’s getting clearer all the time: the greenback is busy eating currencies and economies alive. We are staring down the barrel of so very many problems that are civilization and perhaps even humanity ending, that it is hard to tell what will actually get us. The economy is in La La land, the bull is far bigger than the real economy, we believe workers earning a few dollars an hour are going to be buying new SUV’s, houses and coffee at Starbucks. We believe that a government starved of funds can still maintain all the necessary infrastructure. We believe that industries that are dependent upon the trust of consumers can survive without any regulation. The biosphere is in deep trouble all around, without counting the effects of global warming. Global warming is exacerbating an already very serious problem. Nature had redundancy after redundancy, slowly we have destroyed all that. Someday soon we are going to wipe out some seemingly unimportant species with absolutely catastrophic consequences. We are running out of accessible energy, but should not use what we have got. We have abused antibiotics to the point where they are now often ineffective. We have drunk the hemlock, driven off the cliff, put a gun to our heads and slashed our wrists. Our civilization is committing collective suicide, but in a way that will take the Earth tens of millions of years to recover from. … and the manner in which we’ve done it strongly suggests that we do not deserve any better than the future into which we’re headed.